I’ve been trying to figure out a way to get my 5 years old daughter, Kaitlyn, interested in building. She has outgrown Mega Bloks and Legos are just a bit advanced for her. Strictly Briks’ Big Briks™ seemed to be a good in-between step for her. The blocks are smaller than the Mega Bloks so it doesn’t appear too “babyish” for her. Yet, it’s bigger than the standard Legos, making it easier for her to hold and build with. Big Briks was an instant hit with Kaitlyn. She played with the standard Big Briks and the Silicone Brick and Strap Kit. When she saw the green stackable base plate, she shouted, “let’s build a castle!” The base plate allowed her to build up and out while holding all the pieces in place. The soft, flexible Silicone Briks were her favorite things to play with. She loved the feel of them and the ability to twist them to make things such as bridges, stairs, bracelets, and swings. All of the pieces were easy to put together and take apart. In contrast, Kaitlyn has a hard time building with regular Legos and pulling them apart. As a mom, one of the best benefit of Big Briks is the size. 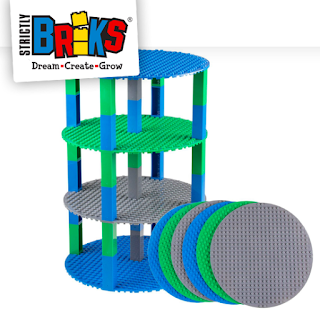 Unlike the small Legos, Big Briks is easy to see on the floor and clean up. No more hurting myself from stepping on blocks! The base plates kept Kaitlyn’s creations in one piece so she could easily carry them and display them in her room. I also loved the tower organizer. I chose the white set and it did a wonderful job at displaying Kaitlyn’s creations. The colorful Big Briks definitely stand out amongst the white so were able to see her figures and blocks better. It was so nice to see Kaitlyn building again. She had such a good time playing with the Big Briks that I would recommend them to anyone! One Winner will Receive 8" Multi-Color Circle Stackables! I do!! Absolutely!! Its a great coordination and fine motor experience! Also gives them the ability to thing of something and attempt the results viz trial and error!! Yes! Totally! It makes kids brains work and think! I do think they are educational because they require critical thinking skills. Yes, construction toys are very educational! She would totally know in future how to improve your travel business! It's so good that you try to develop your daughter's skills.